Sun City Festival Buckeye, AZ is Del Webb's newest active adult community in the northwest valley of Phoenix, Arizona. It is nestled at the base of the beautiful White Tank Mountains 10 miles west of Surprise. The community is full of the latest desirable amenities and highly upgraded - yet inexpensive - new and pre-owned homes for sale. 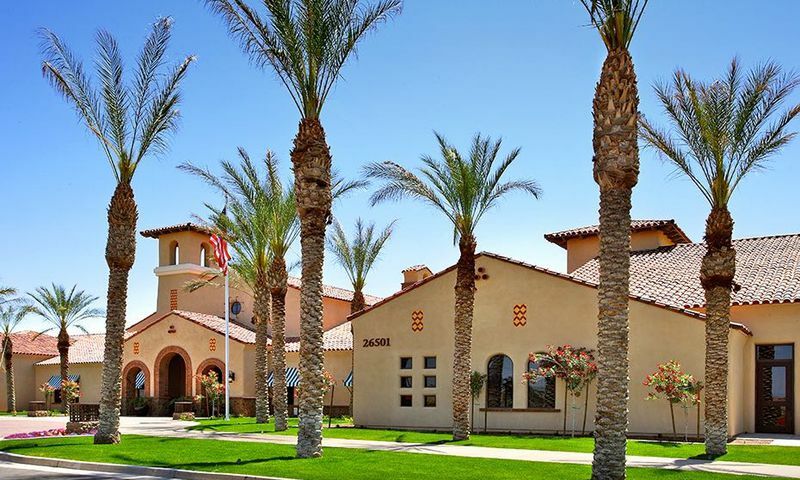 Del Webb combined nearly 50 years of active adult construction experience to design what has been acclaimed as one of their finest communities. Around every turn in Sun City Festival, residents of Buckeye, AZ are greeted with some of the finest amenities and active lifestyle options. Since Del Webb first pioneered the concept of active adult communities in 1960, a lot has changed. Along the way, Del Webb has stayed at the forefront of design and technology to produce quality homes and lifestyles scarcely matched by other builders. This age-restricted community is no exception. An exciting lineup of amenities await the residents of Sun City Festival. The 31,000 square-foot Sage Recreation Center is the main hub of activity in the community. Here, residents can partake in a variety of physical and social activities while they mingle with new friends and neighbors. The Sage Recreation Center has a massive resort-style outdoor pool with cascading waterfalls and lap pool. A state-of-the-art fitness center offers the latest high-end equipment, aerobics and dance studios and spin bikes. Plus, there is a meeting room and a grand ballroom. The Arizona State University Lifelong Learning Academy located in the Sage Recreation Center is like having a private college campus right in your own backyard. Residents gain access to limitless learning opportunities and quality instruction from ASU professors. A variety of curriculum includes travel programs (including overseas), literature, financial planning, computer classes and foreign language. The grounds are an active adult playground filled with enviable amenities that beckon for residents of all fitness levels to get out and be active. The community currently includes a softball stadium, outdoor amphitheater and tennis, pickleball, bocce ball, basketball and volleyball courts. In April of 2011, the community built the 9,000 square-foot Wood Shop & Craft Studio. Here, residents often meet for clubs or attend a class to learn a new class. This building features ceramics, crafts, and woodworking studios. The 18-hole championship Copper Canyon Golf Club managed by Troon Golf is a beautiful course that winds through the community. The course provides a memorable and challenging round of golf for both novices and experts. Another championship 18-hole course is planned for future construction. After a round of golf, residents like to relax with friends at the Indigo Grille. A great menu includes both light lunches and fine dining at reasonable prices. The homes have been designed with the latest sought after floor plans, high-end finishes and energy saving designs. Improved technologies have led to new construction methods that reduce energy loss and promote conservation. There are 22 different single-family floor plan designs that range in size from 1,100 to over 2,800 square feet. Buyers can choose from various new construction and pre-owned resale homes that accommodate all tastes and budgets. Homes are designed with unique Spanish, European, Ranch or Tuscany exterior themes. The competitively priced homes are favored by home buyers who want new construction and modern finishes such as granite countertops and stainless steel Energy-Star appliances. At Sun City Festival a steadily growing list of clubs and classes help the residents fill their days with exciting activities and events. Regardless of your passion, you are likely to find other like-minded residents who share your lifestyle interests. Those who enjoy arts and crafts can join the fine arts club, knitting and crocheting groups, make paper crafts, and more. Fitness and sports-minded folks will enjoy the variety of fitness classes and tennis and golf groups. Special interest groups range from cultural clubs to car club and social dance club. With over a dozen activities that regularly meet, There is also a full-time activities director that helps keep a calendar full of classes and community events. For Del Webb's latest masterpiece, Sun City Festival, they chose a location in Buckeye, far from the hustle and bustle of the suburban reaches of Surprise and Sun City West. Driving west on Sun Valley Parkway through 10 miles of secluded and untainted Arizona desert, visitors escape the traffic lights and congestion as their cares melt away. Right about the time it seems you are lost, this beautiful community emerges like an oasis on the horizon. Sun City Festival is the ideal place for active adults who want a community that offers the latest first-rate amenities and new construction homes. For retirees who want a convenient location near plenty of shopping and cultural attractions, Festival might not be the best choice. It is situated 1,600 feet above the valley floor where the air is cleaner, the summers are cooler and congestion is non-existent. The community's remote location provides visitors a reminiscent look of what the pioneers of the original Sun City saw when construction began there over 50 years ago. Clubhouse - 31,000 Sq. Ft. The Copper Canyon Golf Club is located at 26577 W. Desert Vista Blvd. There are plenty of activities available in Sun City Festival. Here is a sample of some of the clubs, activities and classes offered here. The Holiday Series homes are no longer offered as new construction. There are three floor plans that can be found throughout pre-owned homes. These homes range from 1,099 to 1,398 square feet in size. They offer one bedroom with a den that can be used as a second bedroom, two bathrooms, and an attached two-car garage. The Cottage Series offers two floor plans and are offered as new construction. Ranging from 1,373 to 1,494 square feet they offer two to three bedrooms, two bathrooms, and an attached two-car garage. The Retreat Series offers new construction homes that range from 1,565 to 1,998 square feet of living space. These homes offer two bedrooms, two bathrooms, and an attached two-car garage. The Classic Series also offers new construction homes. There are three floor plans that range from 1,612 to 1,816 square feet in size. These homes feature two bedrooms, a den, two bathrooms, and an attached garage. The garages range from two to three cars. The Premier Series is no longer offered as new construction. Homebuyers can select a previously owned home that range from 1,960 to 2,323 square feet in size. These homes feature two to four bedrooms, two to three bathrooms, and an attached garage. The Encore Series offers new construction homes that range from 2,023 to 2,529 square feet in size. These four floor plans feature two bedrooms, a den, two or two-and-a-half bathrooms, and an attached two-car garage. The Estate Series are the largest homes built in Sun City Festival. No longer offered as new construction, buyers can select a resale home that ranges from 2,450 to 2,849 square feet in size. These homes offer two to four bedrooms, two-and-a-half to three-and-a-half bathrooms, and an attached three or four-car garage. Visited my Uncle there and was initially impressed with the surroundings. Of course, this community is very isolated as it is located on the outer fringes of Surprise...and even much further away from established areas with better infrastructure. His doctors, the malls, and other important needs for living are actually 10-20+ miles away!! Yes, civilization is starting to catch up...but at what cost. You are really really car-dependent out here! Basically, like previously mentioned, services that were promised are not living up to expectations...that includes the activities, the landscaping, the quality of the construction. And the home costs and and the amenities are not inexpensive by any means. Like we all must understand in life, customer service and promises are always top-notched until the money is put down. All in all, my Uncle regrets the move here and feels he should have moved to a community more established and nearer to civilization. We looked at every active adult community in PHX before making a decision to purchase in Sun City Festival. Del Webb's amenities are awesome and the home values, energy efficiencies, and low HOA dues are only a few reasons that made our decision to call Festival HOME. But truly, it's the people who make this community. I honestly believe you'll be hard-pressed to find a friendlier community out there. I'd also recommend a few night stay in their Vacation Villa's to experience this place. You'll have full use of all the amenities and then talk with residents at the Indigo Bar and Grill and you'll see why this place is special. Have been to this community several times over the years and it is amazing to see how it is growing and offering a really great place to live. Have some friends that live here and they love how quiet it is away from the craziness of the city. Purchased a brand new home from Pulte Del Webb. Within only 5 weeks the air conditioning became a problem. Upon contacting the Pulte Del Webb Service Request Office I was told that the air conditioners in these homes "struggle to keep up in the hot weather" and the impression they clearly gave me was that they just were not very concerned. After placing my concern in writing, including one email to the CEO of Pulte, I finally seemed to get the proper response. The repair technician that was sent out seemed very professional. However, it did take several days to finally get it working, apparently primarily due to the expressed lack of concern on the part of Pulte Del Webb. In any event, it is disappointing that it was so difficult to get Pulte Del Webb to honor their warranty. With regards to the gym, the staff there lets the disinfectant wipe containers stay empty, not refilled, so seems like an unhealthy place to work out. Still a lot of construction going on so plan on being woken up at 5:30 AM every morning to the sound of heavy equipment, which seems to be the time the HOA is allowing them to start work. The first time we visited Festival was 2 years ago. After a year of exploring other properties we decided to buy in Festival and have now been residents for a year. When we were given the realtor tour, we could see that the property, the landscaping, ponds, public areas were pristine and well maintained. During the last year, the areas visible to the prospective buyer have been maintained. What you don’t see is that deeper into the community, the landscaping needs attention, the ponds are drying up, and green space is now brown space. We were promised a quality dining venue called Indigo Grill. In the last 6 months, the quality of the food served has deteriorated a great deal while the prices were raised significantly. In the most recent report from Maricopa County, The Indigo Grill was given a “B” rating by health inspectors. During the summer months the bar in the outside patio closes and the area lacks a mister system. Keep in mind that Del Webb is only a name that Pulte purchased and that Del Webb's mission was to build and market a lifestyle. It is unfortunate that Pulte wants only to sell homes, refuses to expand on the amenities and is not sensitive to homeowner’s needs or wants. In conclusion, “BUYER BEWARE”. What you are told and what is delivered most likely don’t match. We are happy we bought here. BUT it has gone down hill. The Indigo Grill has continued to offer poor food while raising the prices and poor management, even though the HOA fees have to support their losses. It appears they may have cut down the watering of the common areas (except those by the sales office). The water features on the golf course look like they may be going dry (except those by the sales office). I would tell buyers to be aware and be careful! Beautiful and friendly community. Well built homes. Always something to do. We love it here. The weather is great and the people are so friendly. We have not had a chance to take advantage of all the activities because we are still getting settled. We love the idea that we have a place to go and eat at the restaurant near the golf course. I am sure we will be here for a very long time and will enjoy every minute of it. Looking forward to all the fun things to do here. Thanks to everyone!!!! We are so happy we chose Sun City Festival. We bought a spec home on the model home we wanted.. We have an enclosed yard and love the privacy of our backyard, enjoying our surround sound out on the patio. Pulte does a great job in building a home. A very nice community to live in and nice to come home from the hustle bustle of Surprise to the serene quiet and beauty of Sun City Festival. Unless you personally experience the tranquility of this spectacular place, you couldn't possibly appreciate its natural beauty. based in the massive clubhouse. is a desert paradise with perfect weather and the starriest skies. We 'test-drove' the community by renting a home for a month. A great way to see if this is YOUR paradise! My husband and I are thrilled with our decision to move to Sun City Festival. We both still work so we have a short commute but we love coming home after a long day to what feels like a luxury resort. We've made a lot of new friends and our home is just beautiful. It's so nice to have a brand new home, just like a brand new car! I think my favorite thing to do is relax by the pool while my husband golfs with his friends. Then we meet up for dinner at the Grille and talk about how we're gonna start that new diet tomorrow! Ha! This is a fantastic active adult community. The homes are generous in size and come with all the upgrades you would want. The community is beautifully kept. The activities are plentiful and the neighbors are the best. You can't go wrong adding a visit to SC Festival to your winter or spring break. There is a spectacular 18 hole golf course, beautiful, fully-equipped gym, pools, spa, craft and woodworking shops. The softball field is gorgeous! The on-site restaurant has an amazing selection and if you're into happy hour you'll love the live bands and flowing drinks. If you enjoy starry night skies and amazing sunsets, Festival is where you want to be. We are located about 10 miles from town and it's so peaceful here. There's something for everyone at Festival! Come and be our newest neighbor. 55places.com is not affiliated with the developer(s) or homeowners association of Sun City Festival. The information you submit is distributed to a 55places.com Partner Agent, who is a licensed real estate agent. The information regarding Sun City Festival has not been verified or approved by the developer or homeowners association. Please verify all information prior to purchasing. 55places.com is not responsible for any errors regarding the information displayed on this website.